Gift wrapping is one of those things that looks insanely easy, but actually ends up being the hardest part of your holiday prep... When it comes to wrapping your perfect gifts we have you covered with easy ways to be creative and look like a pro! 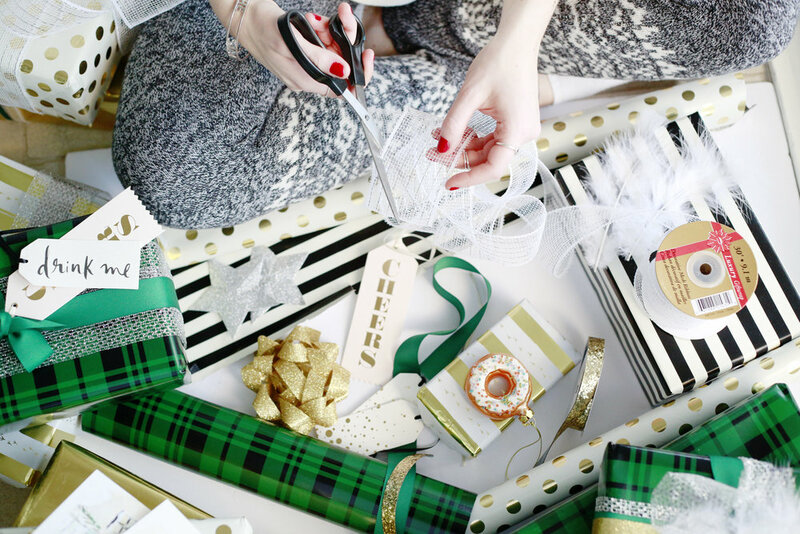 We adore most things Kate Spade... but her wrapping paper takes things to the next level. This double sided design dream fits perfectly into our ideas of bubbly sparkly Kate branding. We love the black and white strips on one side and the gold and white polka-dots on the other side. Perfectly clean and glam, mixing two awesome prints for your convenience. 2. Sequin ribbon Adding sequin ribbon into the mix with your holiday wrapping will automatically make it look like a lot fancier.... Think adding sequin shoes to your already glam dress. 3. Make bows, buy bows, lots of big bows! The same way as centerpiece can tied together a table, the bow in the middle of your wrapping can tie together a gift. Statement bows can change an entire look and feel of a present. We love contrasting the wrapping to the bows like we do accessories! 4. Gift tags almost as great as the gift. Of course all of the gift wrapping from Kate Spade is adorable but her gift tags tend to take the cake. With cute little lines like "cheers" and "this rounds on me", she took the idea of celebrating any occasion and made it come to life through just the tag.
! Be creative with your own personal style! We love feathers right now so we've added on fun beautiful white feathers to our sparkle and ribbon. An easy touch that can transform and "glam it up". All of the above are easy ways to layer on and decorate but the hardest part is coming up with how to do so.... and with what! We're trying to inspire and send you in the right direction, the rest is up to you to dig deep into your inner glam. Stock up on supplies, enjoy a glass of bubbly, turn on your favourite playlist and create! Enjoy!